When we first saw this flower in our land in 2004, we realized that when it was swinging with the wind with its elegant flower, it added a different color to our field and we started to investigate. Sinan’s masterpiece - the Selimiye Mosque Complex is the most important and, at the same time, the most famous historical monument of Edirne - a city located in the European part of Turkey. One of the interesting facts about the mosque is the upside down tulips, which are a symbol of Edirne, have their origin in a tulip illustration engraved on a marble in the fountain right under the central dome of Selimiye. They are believed to symbolise the landlord of the tulip garden on which the mosque was built. Naturally, he was reluctant to give over his beautiful garden. The reverse tulip motif can be found in many places in the area of Selimiye, in various sizes and shapes. In Yesiluzumlu region, the Duguk bird begins to sing as "duguk duguk" in March-April. This is the indication of migration of the birds to the highlands. This migration is very important in our wide geography and reflected in our folk songs. During this time Duguk starts to flower. That’s why our local people named this reverse tulip as Duguk. Latin name Fritillaria acmopetala. Another name used for reverse tulips in our country is in Weeping bride. We noticed that Fritillaria plants with their beautiful and remarkable features as a group ,attract the interest of fanciers of ornamental plants in recent years. In Van 100. Yıl University, serious research has been done on this subject. We contacted the university and requested a review on site. The information we provide here is the information we have obtained from them. After visiting us, they visited a symposium on bulbous plants in the Netherlands at the end of April 2007 and and visit the Keukenhof garden(http://www.keukenhof.nl) ….afterwards he informed us that this plant is being used as a cut flower . After the 1st World War, the bulbs and seeds of the reverse tulips were collected from nature and cultivated in the gardens. It is known that there are over 200 species and subspecies in the world. Fritillaria are found in the northern hemisphere. Our country has a very rich flora including Fritillaria species, as is the case for many other plants. Bulbous plants are among the rare species of this rich flora. After completing the growth, the magnificent flowers die became yellowish, leaving the nutritious material under the soil. Bulbs continue to live for many years. There are all kinds of climatic and soil characteristics necessary for the cultivation of reverse tulips in Anatolia. There are many references in our country that up to 40 reverse tulip species and sub-species are growing. Fritillaria species, which attract the attention of human beings due to the color, brightness and difference of their flowers, have a height of several cm to one meter height. Some have a single flower, while others have a dozen of flowers. There are differences in the color, size and characteristics of the species. It grows easily and grows in all kinds of habitat. Fritillaria acmopetala with its dark chestnut color toning besides its greenish form of its flower, is unique among Fritillaria species. Fritillaria acmopetala Boissier can be seen primarily in Turkey’s Mediterranean and Aegean coasts and in the Mediterranean coastal areas of Cyprus, Lebanon and Syria, in the mountain slopes generally up to 1200 m. Its natural environment is under the trees or the calcareous soils in the forest. 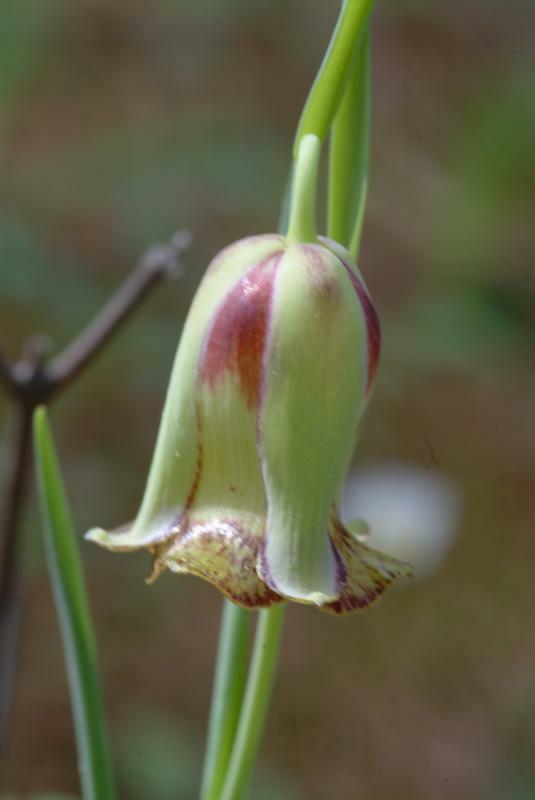 Although Fritillaria acmopetala grows in certain habitats in its natural environment, it can be used in landscape planning in all kinds of land in full or semi-shade places. It grows easily in the gardens where it is planted and when it is not damaged, it forms communities. Therefore, it is an important species that can be used to create a natural view to the field of artificial groves, rock gardens and grass areas. 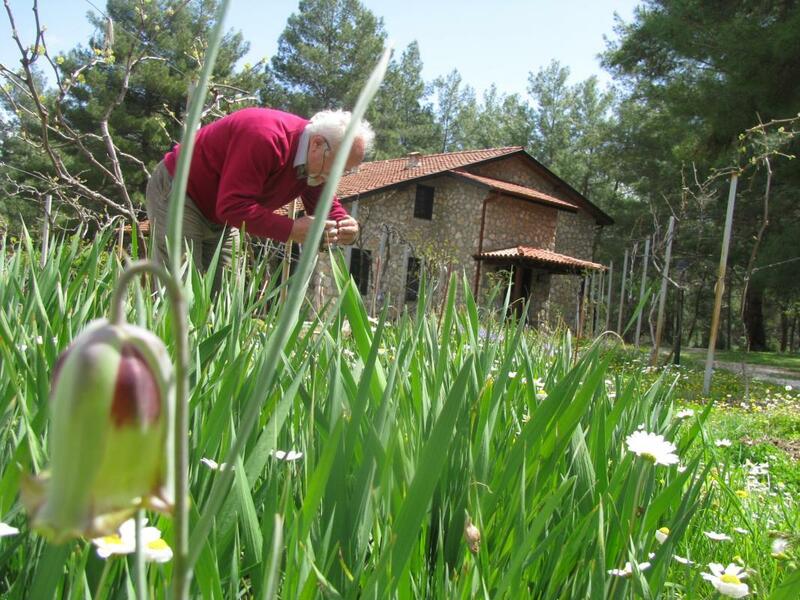 In order to protect this unique seasonal flower that is blooming in Yesiluzumlu region in March-May, we are trying to protect the area in our land by labelling and putting notes in order not to be cut. It is our dream to protect this unique flower ensuring the healthy continuation of its generation in nature by spreading bulb production in our region as an alternative to collecting onions from nature unconsciously. Ömer Ali Öncü, a special person in our memories from our childhood, and everybody knows him as Omar Al-Dayı… the deceased attended to the wars, subjected to torture. We could not exit Muar Önü (fountainhead) when he was the security guard of the village. He caught the snakes, put them in his bosom, he frightened the children and sometimes he used to sing folk songs and folk songs. What a good song we’ve lost. He used to say the following verses as if he were reading a letter. Here is a letter from a soldier, remaining from it. Did gray dukkuk started to sing in Yesılgol highlands? Did piny land of İncirkoy started to florish? Did the bride with golden hair went to highlands? That’s why I missed my homeland my father. ÜNAL ŞÖHRET DİRLİK: "I compiled this soldier letter from Ömer Ali Öncü in 1953 / 54 summer"
Neriman Özhatay, Andrew Byfield, Sema Atay, İstanbul 2005, Türkiye’nin 122 Önemli Bitki Alanı ISBN:975-92433-7-7. Photographs by Şevket Alp and Ayşe Güray Genç.